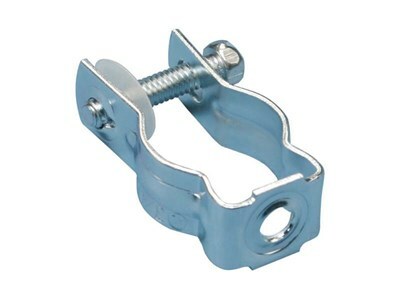 Conduit clamp- 3-1/2 Inch rigid or EMT; 5/16 Inch mounting hole - Each. Our line of Erico Electrical and Datacomm Fasteners are perfect for those big contractors running thousands of feet of cable. Or someone just doing a few home improvements. Whoever you are, Erico Electrical and Datacomm Fasteners are the right choice for you. ERICO offers CADDY Conduit Clamps with Bolts. Mounting hole size CD0 thru CD3 for 1/4" bolt. CD4 thru CD9 for 5/16" bolt. Available in 3/8" mounting hole for 1/2"-2" pipe. To order add suffix 37 (ie. CD2B37). Also available in stainless steel 302 - contact factory for price and delivery, to order add suffix SS (ie. CD2B-SS). Stainless do not have nutless feature. Can be used in all locations where EMT or rigid conduit is used.